This Wednesday I was able to attend a staff meeting for Apples and Snakes, “England’s leading organisation for performance poetry and spoken word.” Apples and Snakes is an associate of Free Word and is based over at The Albany in Deptford, South London. I’ve been attending poetry slams and open mics for 6 years now and have been reading my own poetry for about 2, so I was eager to connect with this particular organization. With bean bags on the ground and fitness balls as desk seats, the cosy office space was just as welcoming as the staff who occupied it. I sat in an oversized scarlet chair, surrounded by employees who spoke of exciting past and future programs. Most of the staff are poets themselves and are immersed in their work for the spoken word community. It was really quite moving, actually. Apples and Snakes hosts regular open-mic readings, manages free expression workshops (some with inmates in prison) and have most recently launched a nationwide youth poetry slam competition called Shake the Dust – all ambitious endeavours for a relatively small organization. But what I found most impressive was their work with individual spoken word poets. The organization acts as a consulting service to new and old poets who need to get their feet off the ground. They challenge writers to go beyond their comfort zones, providing for them avenues of exposure while teaching them the necessary skills to grow as performers. It’s a service I know I’d seek out if I were a London poet. After the meeting, I was fortunate enough to attend Apples and Snakes’ free performance poetry night called Jawdance. Though I didn’t plan on reading at the time, Free Word and Apples and Snakes staff convinced me to sign up. I hadn’t read my poetry in London yet, and I hadn’t been on a stage in months, so naturally I was completely terrified. But reading was something I really wanted to do during my stay in the UK, so I suppose I was apprehensively thrilled. The stage that night saw a diverse group of poets. There were newbies, oldies, experimental poets, some soulful, some humorous – all entirely accepted by the audience. They even screened a couple colourful poetry shorts. It was a variety I hadn’t seen before at other readings. It really got me thinking about the limits of spoken word, and the boundaries I have placed around my own poetry. It was a refreshing open-mic experience. Inspiring. In a safe space like Jawdance, where all forms of spoken word expression are accepted, there is so much potential for new ideas. And of course it made it easier for me to get on stage and spit. It’s the type of community you can be proud to be a part of, and I was extremely proud to share the stage with such talent that night. It’s an experience I will never forget. Check that off my London bucket list. Here’s a video I made for my media production class in the spring. Not sure why I didn’t post it then. Tons of fun! First, place fideo noodles into skillet. Keep stirring until browned. After browning, add water and let boil for 1 minute. At this point, add salt, pepper, tomato sauce and ground comino into pan. Add more water if necessary. For 4 ½ minutes, let sit and stir until noodles are completely cooked. If preference is less soupy fideo, let sit for 1 minute longer. EAT! At Free Word, we know that words matter. Speaking out for what people believe makes us feel human. Having the freedom to read and write what we like gives our lives meaning. We need words not just to live but to flourish. Last week I began my 6-week internship with Free Word, a London based non-profit organization and literary centre that is home to nine other organizations. These organizations all have literary focuses, but range from legal publications to free speech activist groups to literacy agencies. I’ve learned a lot about Free Word and its residents in my first three days, and its clear that there’s still plenty more to learn. When I first arrived at the centre, I was initially quite intimidated by this literary community, and I still am. I have undertaken two previous non-profit internships back in the states, but nothing of this magnitude. But the longer I’m here the more I realize how perfect this place is for me. The Free Word Centre is a hub for literature, literacy, free speech and expression – all things I value deeply. And I’ve found that the people here value what they do so deeply as well. But that is really only the tip of the iceberg. The Free Word Centre is a unique arena for non-profit organizations. Since my first day, I’ve met key players at resident organizations and I’ve heard time and time again that though the nine organizations function independently, they act as one united machine – helping one another, using each other’s resources and collaborating in a way that I haven’t witnessed back in the states. It’s this type of community that the non-profit world so desperately needs – particularly in the literary arts. I understand the challenges non-profit organizations face, and this place allows resident organizations to overcome obstacles in a way that other organizations can’t, or won’t. There’s so much potential for growth here. Each of the nine Free Word residents has its own values, and each functions in its own way. But each has specific insights that can benefit an organization that resides right down the hall. I’m certain non-profits around the world can learn from what Free Word is doing here in London. I know I am. I am so grateful to have been placed with an organization like this at such a pivotal point in my life. There’s so much I’d like to do in my six weeks here. But for now, I think I’m just going to soak it all in. For Professor Annie Hubbard’s sociology class at St. Mary’s University, students were separated into groups and asked to come up with an idea that would implement social change locally. 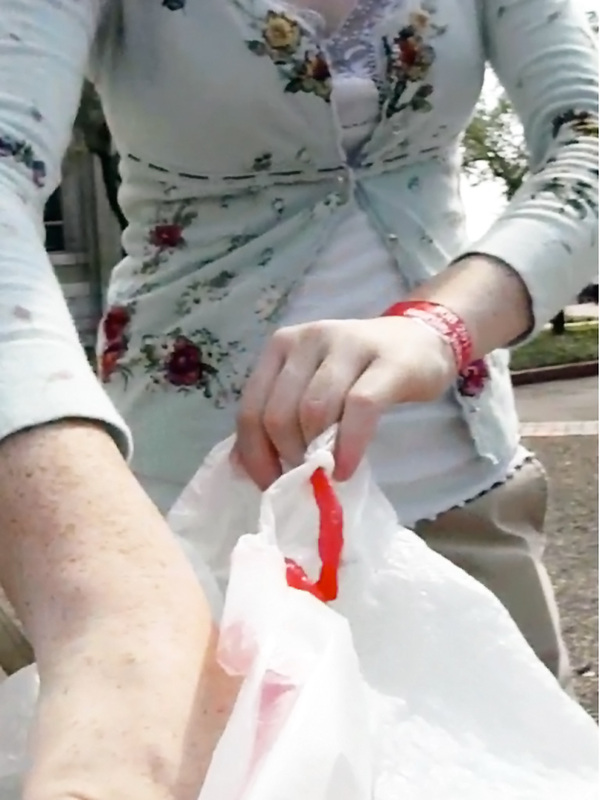 For this social activism assignment, sophomore music and teacher education major Elisha Bryant and her group members decided to raise awareness about pollution by carrying around bags of their accumulated trash for one full week and challenging others to do so as well. In this 1 minute video, Bryant discusses this project’s impact on her life and on the St. Mary’s community. They sweep our floors, change our trash bags and maintain the appearance of our entire campus. But what does it take to be a St. Mary’s University housekeeper? In this interview, housekeeper Genevieve (Genie) Huerta explains her daily duties and discusses the significance of her role in the St. Mary’s community. 1. “This is the face my doggie Pebbles makes when he’s hungry,” says dog lover Crystal Puertas. 2. Joshua Hinson revises his latest slam poem piece for competition at “PuroSlam,” which takes place every Tuesday night at On The Half Shell, 202 Navarro St.
3. Joy Jimenez escapes the crowd with her son Joshua at a local poetry reading. 4. Elizabeth Sexton, left, and Crystal Puertas, right, share an intimate hug before a night out on the town. 5. Sean Torres balances bananas on his head to help his best friend, Stephen Guzman, take an artsy photo for his Media Production class at St. Mary’s University. Welcome to my site! Here you will find examples of my professional and not so professional work. I will also provide little snippets of my life from time to time. Enjoy!